This is the third test knit that I finished in June. This is a quick little project. It’s called a scarf, but it’s intended to be worn like a neckerchief. The designer used Cascade Eco yarn when designing. I used yarn from my stash. I had a hard time matching gauge. 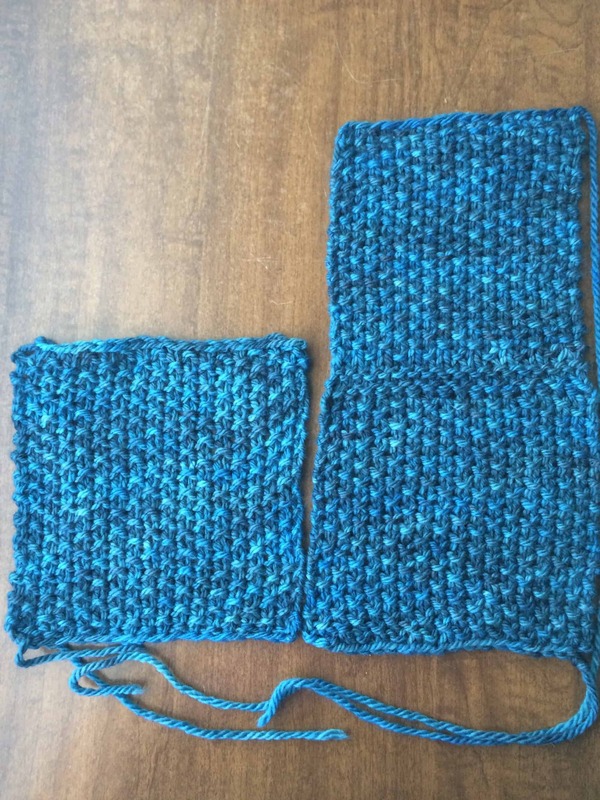 I actually knit 3 swatches — something I never do, and probably wouldn’t have done if this wasn’t a test knit — and chose the largest of the three sizes as that was the closest to the designer’s gauge. I ended up cannibalizing all three swatches to finish the scarf; I used every inch of the skein. 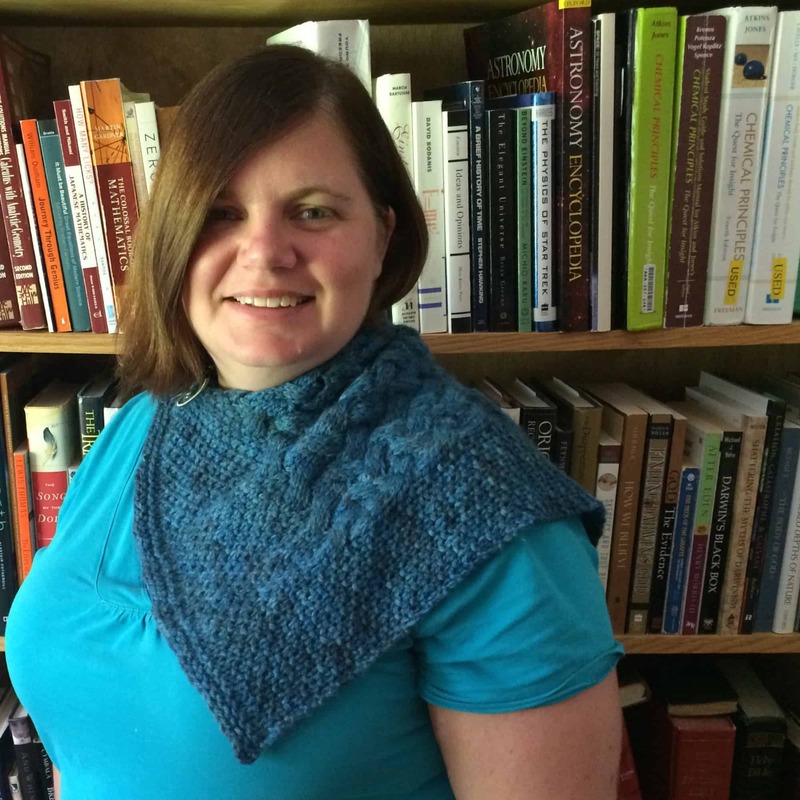 Despite using all the yarn I had in the skein and pinning the scarf out to the designer’s intended dimensions of 14″ x 22″, my scarf was too short. When I unpinned it, it shrank down to 13″ by 19″. This proved to be too small for me to wear. 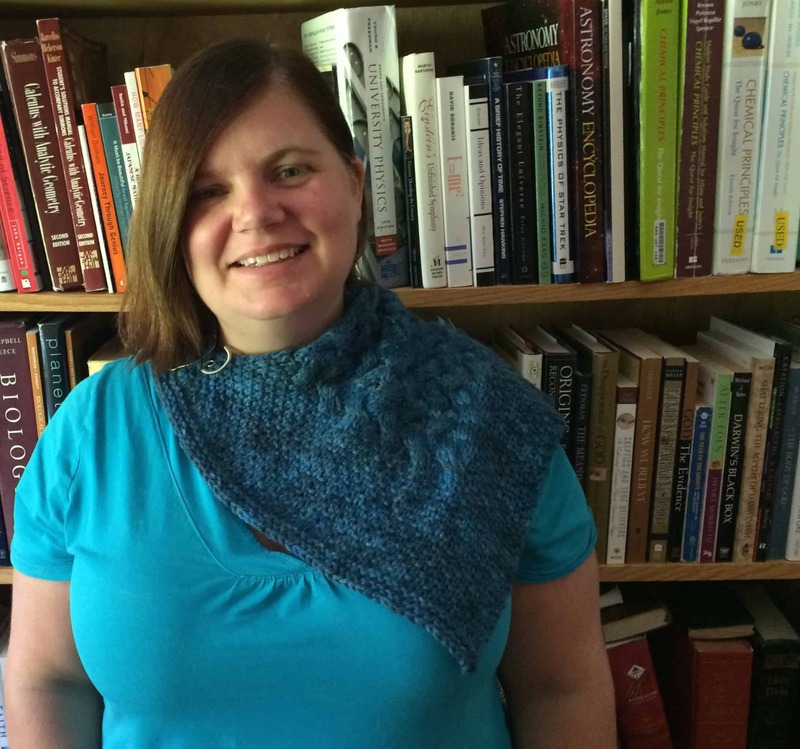 In order to take pictures wearing the scarf, I pinned it with one of the shawl pins I got at the Hoosier Hills Fiber Festival. It is really tight on my neck! Since it doesn’t fit me well, I’ll gift it to someone else, but I’m not sure who yet. It’s a well-written pattern. The cables look fancy, as they always do, but they are very straightforward cables. This pattern is a good choice for someone new to cables. I worked from the written instructions, as I always do for cables, but the pattern also includes charts. As I mentioned in the Sand Tracks Scarf post, I almost always form cables without using a cable needle. I use a cable needle if the yarn is very slippery, e.g. the Cascade Pinwheel I used for the Palindrome Scarf, Palindrome Hat, and Irish Hiking Mittens last year. I might use a cable needle for something like the Sand Tracks Scarf, which had purl stitches in the cable, since it’s easier to drop those stitches. Before the Grisou Scarf, I had formed 2-stitch, 3-stitch, and 4-stitch cables without a cable needle. The Grisou Scarf cables are 6-stitch cables. I decided to knit the Grisou Scarf without a cable needle, just to see if I could. For the first 3 pattern repeats, it did not go well. 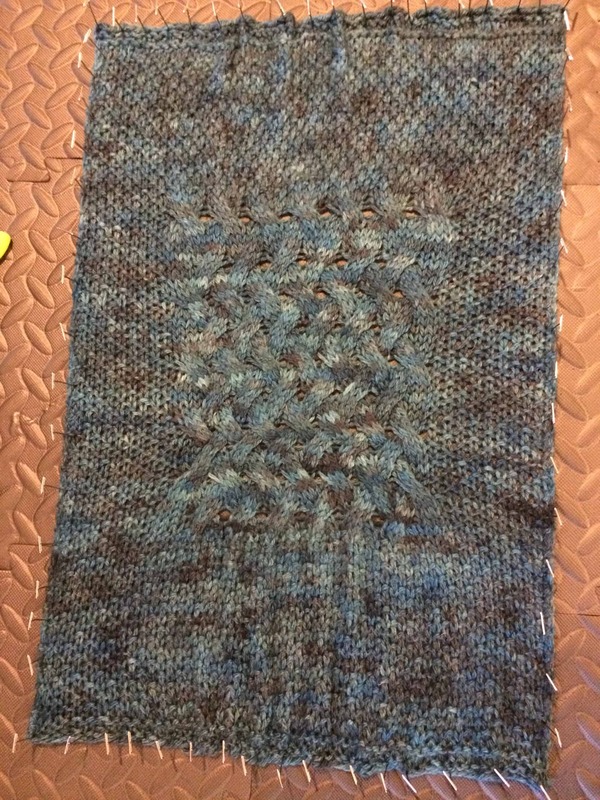 I dropped stitches on every cable row. I still don’t know how I was dropping them. I was carefully counting to make sure that I got them all back on the needles, only to find that I was missing a stitch. The scarf took many hours longer to knit than usual as a result of my stubborn refusal to use a cable needle and the resulting need to rip back to fix stitches dropped from the middle of cables. Finally, I decided to record a video demonstrating cables without a cable needle. Miraculously, I didn’t drop any stitches in the making of the video, or in any of the cable rows after that! I’m not sure what made the difference. The video is 18 minutes long because I recorded two full rows of cabling, one with stitches held to the front and one with stitches held to the back. I planned to edit it down to just a couple of examples, but decided to leave the entire thing so that if you are watching the video while working cables, you don’t have to stop and rewind to watch the demonstration again. The video starts with stitches held to the back. After two examples, I added a note in the video telling you the time stamp where stitches held to the front starts, so you can fast forward if you are ready to do so! I hope you find the video helpful, and I’m happy to answer any questions you have. Great job. I think the colour really suits you. Have a wonderful weekend.